House in OSU (president Office). 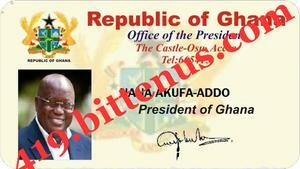 Your name has been nominated as the next Ambassador for the African Refugees. I want you to forward all your details to us so that we can pass your details to the United Nation Head Office in England and United State Of America so that United Nation Head Office in New York in United State Of America can put your name in the registration Book for this appointment and send you official letter regarding this appointment. 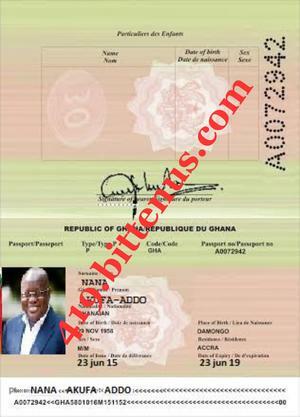 their is fee of $100 Usd that you are ask to pay for this Appointment to Register you as the NEXT AMBASSADOR to African Refugee from the United Nation Head Office, and this payment should be send to us by Western Union Money Transfer to Local Accra Ghana to this Receiver information below. 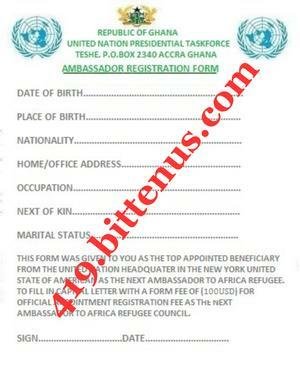 Please do this and try to be honest with us because the reason you are were being appointed is because you are present and your past assistance you have give to African Refugee's this is why you are being favor and for your notice this Appointment will pay you a monthly Salary of $75,000 Usd monthly with weekly payment of $7,500 Usd with Diplomatic Pass Port and United Nation Private Jet to travel any where in the world and you will have your office in the United State and African. with your position as Ambassador you will be the only one to have final saying over any transfer of your fund and every other beneficiaries fund transfer from African. i wait to hear from you sir. please try you send the fee today and call me once you send the fee.